Chicken Soup, considered a classic comfort food, is made in just about every country and has long been touted as a form of folk medicine to treat symptoms of the common cold and related conditions. One of my favorite series years ago was Chicken Soup for the Soul. This series was a collection of short inspirational stories that were meant to be good for your soul, like chicken soup is good for your body. In a large dutch oven, starting breast side down, brown chicken breast on both sides in canola oil. Remove chicken onto a plate and set aside. Add celery, carrots and onion and saute for five minutes. Add your garlic and saute nanometer two minutes. Add the bay leaf, thyme, which has been crushed between your fingers and place your browned chicken breasts back into the pot. Add water and chicken base. Bring to a boil, reduce heat and let simmer until the chicken is tender and falls off of the bone about 30 minutes. with a large slotted spoon remove chicken and let cool five minutes. Remove the bones and just tear the chicken apart about with the times of a fork. 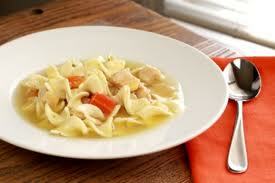 I like to make my chicken soup with chunks of chicken. Check soup for bones adn then return the chicken back to the pot. At this time, check for flavor and if you need to add any more water and chicken base. I usually add another quart or so of water and two more tablespoons of chicken base at this point. Be sure to taste to see how much base you really need. You can alwasy add, but you can’t take away. Bring to a boil, add egg noodles adn simply cook until the noodles are tender about 8 minutes. Season with salt and pepper. Grab and big bowl and a spoon and enjoy! More like a thick stew, I can’t forget to add Chicken and Dumplings to this list of favorites! Here’s a video for you! One Comment on "Chicken Noodle Soup"
Looks delicious! Glad to have your recipes as inspiration for dinners ’round our house. Looking back at the other soups, I’m going to give the gumbo a try too. Thanks!